For a guide to science sites in Philadelphia, see the following article in the Physical Tourist section of “Physics in Perspective”: Paul Halpern, “Philadelphia: Life, Libery, and the Pursuit of Physics,” Physics in Perspective 11 (2009), 209-227. “Physics in Perspective” regularly publishes such Physical Tourist articles, 31 of them since 1999, about half of which have been reprinted in John S. Rigden and Roger H. Stuewer, ed., The Physical Tourist: A Science Guide for the Traveler (Basel, Boston, Berlin: Birkhäuser, 2009). Wagner Free Institute of Science, from 'Manufacturer and Builder' (1874). Image available in the public domain. 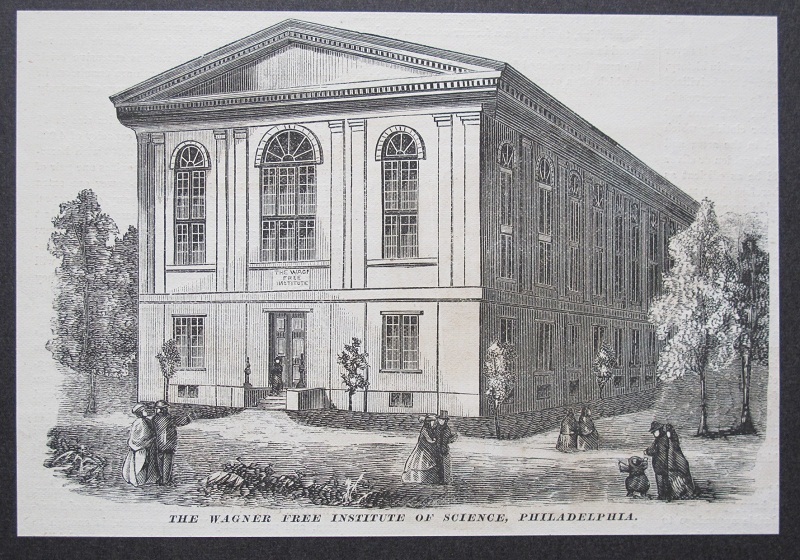 The Wagner Free Institute of Science has its origins in the adult education movement which had started in 1821 in Great Britain with the foundation of the Edinburgh School of Arts, a similar movement developing only very slightly later in the United States. Philadelphia was a thriving commercial city by the first half of the nineteenth century; culturally some institutions, including the Library Company (1721), the University of Pennsylvania (1740) and the American Philosophical Society (1743) had been established pre-Independence. These catered for the middle, educated classes. The Franklin Institute for the Promotion of the Mechanic Arts, founded 1824, was more in the nature of a British mechanics institute. William Wagner (1796-1885), a Philadelphian of German descent, felt that there was a need to provide more educational opportunities for working people. He had become wealthy as a merchant in the lumber trade and he had a passion for natural history. In 1840 he sold his business, which provided him with sufficient capital to live the remainder of his life as a gentleman and philanthropist. From 1859 to 1865, a fine purpose-built institute was constructed in neo-classical style, and it survives to this day. It originally included a library, classrooms, a lecture theatre and a large museum hall for natural history on the upper level. Following Wagner’s death in 1885, the building was somewhat remodelled and the museum was revised under the supervision of Joseph Leidy (1823-1891), professor of anatomy at the University of Pennsylvania. It is this reorganised display which is the basis of today’s museum and it is a remarkable survival: very few of today’s museum presentations can be seen to follow the organisation of a nineteenth-century display so closely. Most specimens are presented in cherry wood cases constructed in the 1880s and many retain the original handwritten curators’ labels. A particular strength is the collection of fossils from American sites, many of them collected by Wagner himself (see Earle E Spamer and Catherine A Forster A Collection of Type Fossils in the Wagner Free Institute… with a History of Paleontology at the Institute (Philadelphia 1988)). Sadly, the philosophical instrument collection, used for teaching by demonstration, is much diminished. The ground floor of the building, which includes the library and lecture theatre, has a splendid varnished-wood, Victorian quality about it. Lecture courses on scientific subjects continue to the present day, though they are now organised at a number of sites around the city as well as in the original building. The serial Transactions of the Wagner Free Institute of Science commenced publication in 1887, though it appeared irregularly. The Wagner Free Institute survives in a somewhat run-down part of the city and is best visited by taxi. There are few really significant displays of the history of chemistry to be seen anywhere in the world. The CHF’s Masao Horiba Gallery is one of the few, and it is amongst the most recent. Its importance is based on a coherent and systematic collecting policy, and intelligent displays which are addressed primarily to thinking adults. As the development of the CHF’s museum activity only started rather recently, the strength of the collection lies in the period since the Second World War. Expert advice to the CHF has been provided by a group of distinguished chemists, meeting twice a year, who themselves were involved in the development and use of analytical instrumentation. Dedicated curators on the staff arrange to collect, conserve and store items which are identified as being desirable for the collection. It was they who developed the current permanent gallery, opened in 2008, named ‘Making Modernity’. There is additionally a small gallery for changing exhibitions. The displays are strongly object-based and deal with challenging topics. The main hall includes islands of objects which are concerned with instrumentation and how measurements are used to illuminate chemical problems. Around the edge of this gallery are displays showing earlier techniques and some of the novel products developed by chemists, such as dyes and synthetic materials. Dominating the space is the very large Video Column which is an innovative and thrilling form of presenting the chemical elements, indicating what their properties are by means of short film clips. Above the main hall, and adjacent to an excellent modern conference centre, runs a gallery with cases presenting displays about chemists and themes. The CHF possesses a collection of portraits, including particularly fine examples of Robert Boyle, Joseph Priestley (who spent the last ten years of his life in Pennsylvania) and Joseph Louis Gay-Lussac. One of the themes concerns young people’s chemistry sets and teaching more generally. The display was developed with the design input of the well-known New York firm of Ralph Appelbaum Associates, and for those who know about such things, the presentation bears their strong signature. An extremely important group of seventeenth and eighteenth century paintings which are displayed (but not in the area to which the general public is admitted) offer representations of alchemists in their laboratories (see Lawrence M Principe and Lloyd DeWitt Transmutations: Alchemy in Art (CHF: Philadelphia, 2002)). Chemistry displays in museums are particularly difficult to develop. Conceptually, the subject is difficult for most visitors. The objects themselves may be important, but that does not make them visually compelling. It is all too easy to end up with a ‘book on a wall’ type of display which offers verbal explanation, but little else. The CHF has been aware of the problems and the dangers which lurk. A visit for science historians is highly recommended (it has to be admitted that the author of this piece was involved in the establishment of ‘Making Modernity’), in part to act as a focus for discussion of the public presentation of recent science history. A particularly interesting comparison is with the Museum of the Royal Institution, London, which was developed at more or less the same time. West side of the American Philosophical Society, by Ben Franske. Image licensed by Creative Commons Attribution-ShareAlike 3.0 Unported license via Wikimedia. The full official name of the Society is the American Philosophical Society, Held at Philadelphia for Promoting Useful Knowledge. The name dates to 1769, when two scientific societies merged, but the APS traces its origins to 1743, when Benjamin Franklin and others formed the organization to provide a way for its members to get together to discuss “philosophical” matters. For Franklin, “philosophical” meant natural philosophy, the study of the natural world, science, and practical knowledge. The APS is still a membership organization, with about 1,000 elected members accomplished in a broad range of fields, from science to civic and cultural affairs to social sciences and the humanities. It is the first learned society in the United States and meets semi-annually in interdisciplinary, intellectual fellowship. The APS also has a number of core programs. Research grants support a wide range of activities, including one of the oldest grant funds for ethnographic and linguistic field work. The Publications Department publishes monographs and journals, including the oldest learned journal in the country. The Museum, whose antecedent is Charles Willson Peale’s museum of the eighteenth century, puts on exhibits that reflect the interests of the Society and its collections. 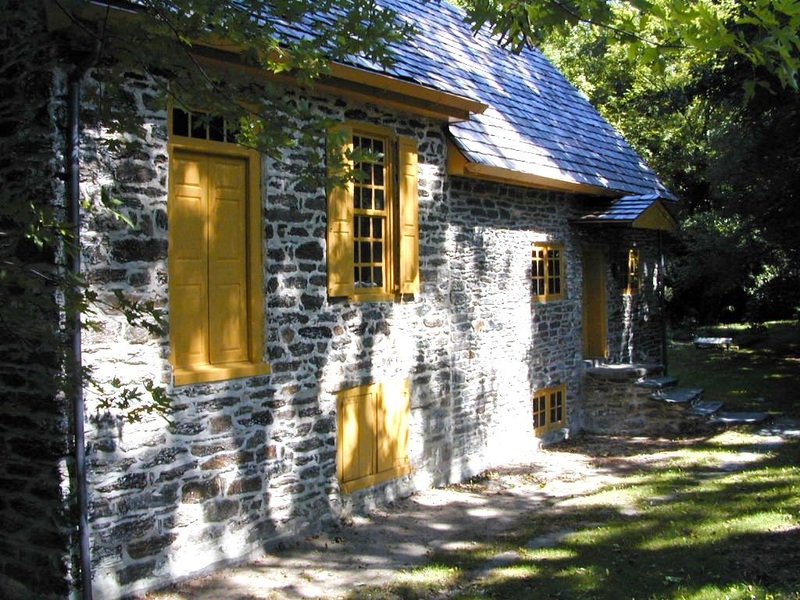 While it is an organization separate from the APS, the Philadelphia Area Center for the History of Science (PACHS), which offers fellowships, colloquia, and a federated on-line search tools, has its offices in one of the APS’ buildings. The Museum has a changing program of temporary exhibitions, on interrelated themes of science, art and history; many – in fact most – of them are of direct interest to historians of science. See http://www.apsmuseum.org/. The Museum is located in Philosophical Hall, right next to Independence Hall, which is itself across the street from the Liberty Bell. You can visit the Liberty Bell for free any time it is open (the APS Museum, too, though donations are welcome), but you need timed tickets to see Independence Hall; tickets are free and available at the Visitors Center. The Library has exhibits in its foyer, which is open to the public weekdays. During the summer tourist season there is an exhibit of treasures of the APS. Almost always on display is one of the original journals of Lewis and Clark, most of which were deposited in the Library by Thomas Jefferson in 1817. Representation of waterspout accompanying "Water-spouts and Whirlwinds" by Benjamin Franklin c. 1750. Image available in the public domain via Wikipedia. Library Hall, located across the street from Philosophical Hall, is home to one of the great independent research libraries in the country. 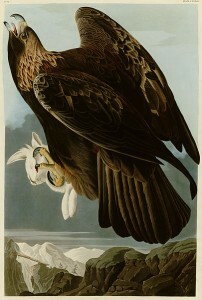 Using the Library requires registration and making an appointment (see http://www.amphilsoc.org/library/research), but should you have an interest in one of the library’s collection strengths, there are rich holdings to explore. The three main collection areas are American history before 1860 (including the papers of Benjamin Franklin and Charles Willson Peale and his family), Native American ethnography and linguistics (including the papers of Franz Boas), and, of course, the history of science. Early natural history is represented in such collections as the Benjamin Smith Barton Papers, the papers of John LeConte, and the journals of André Michaux. 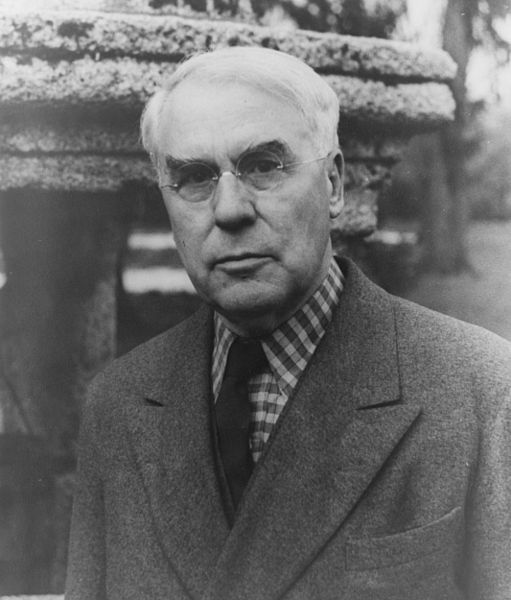 The papers of ornithologist Robert Cushman Murphy are in the collection. Many other disciplines are represented: evolutionary biology (Charles Darwin, George Gaylord Simpson), physics (Edward U. Condon, John Wheeler); biochemistry (Carl Neuberg, Erwin Chargaff), computer science (John W. Tukey), bacteriology (Salvador Luria), neuroscience (Warren McCulloch), microbiology (Herbert Jennings), pathology (Peyton Rous, Simon Flexner), plant genetics (Barbara McClintock). Indeed, the genetics collection is among the best in the world and includes the papers of Theodosius Dobzhansky, L. C. Dunn, Sewall Wright, P. M. Sheppard and Curt Stern, to name a only a few. In addition, the APS is one of the largest repositories of eugenics collections in the world, holding records of such organizations as the Eugenics Records Office and the American Eugenics Society as well as the papers of Charles Davenport. The Library also has a large collection of printed material, including some 275,000 bound volumes, thousands of maps, and tens of thousands of prints and photographs. Among the special printed collections are the Richard Gimbel Thomas Paine Collection, the Samuel Vaughan Collection (a rare, intact late 18th-early 19th century private library), and the James Valentine Charles Darwin Collection, containing works by Darwin in 25 languages. 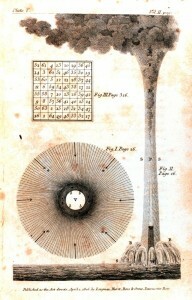 Complete information about the American Philosophical Society can be found on its website, www.amphilsoc.org. A Map of Lewis and Clark's Track, Across the Western Portion of North America From the Mississippi to the Pacific Ocean; By Order of the Executive of the United States, in 1804, 5 & 6. Copied by Samuel Lewis from the Original Drawing of Wm. Clark. Image available in the public domain via Wikipedia. The APS is home to one of the original journals of Lewis and Clark, most of which were deposited in the Library by Thomas Jefferson in 1817. 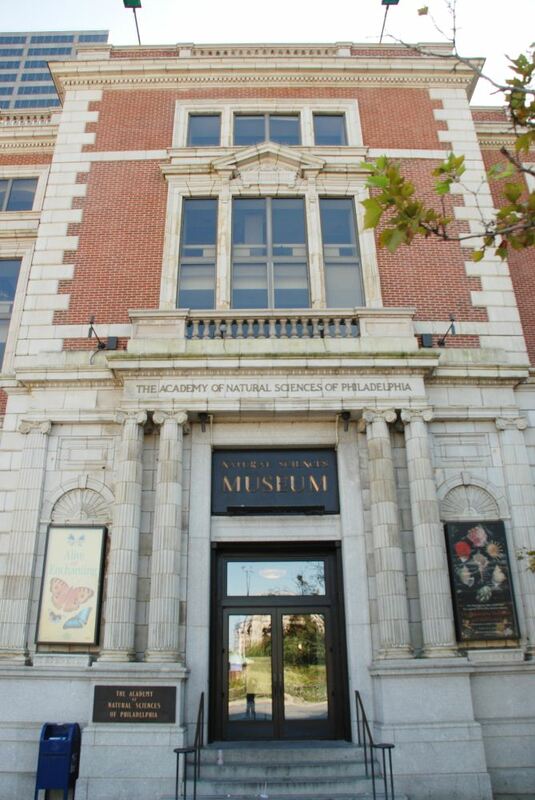 Adorning the century-old Beaux Arts College of Physicians of Philadelphia is a large banner advertising the Mütter Museum as a “disturbingly informative” place. This prestigious historical building — now a national landmark as “the Birthplace of American Medicine” — embodies the historical medical legacy of Philadelphia and its numerous firsts: first medical school, first hospital, first school of optometry, first medical college for women, first school of pharmacy, first children’s hospital, first hospital dedicated to the eye, and more. The College hosts two collections, the Historical Medical Library and the Mütter Museum, the latter having become a cultural landmark for an audience that extends well beyond the medical cognoscenti. The College has grown with the nation. Founded in 1787 by physicians including a signer of the Declaration of Independence, Benjamin Rush, MD, the College aimed to raise the competence and standing of physicians and to relieve human suffering. The fellows, accomplished physicians who are elected to fellowship by their peers, remain at the core of the College and now number over 1400. 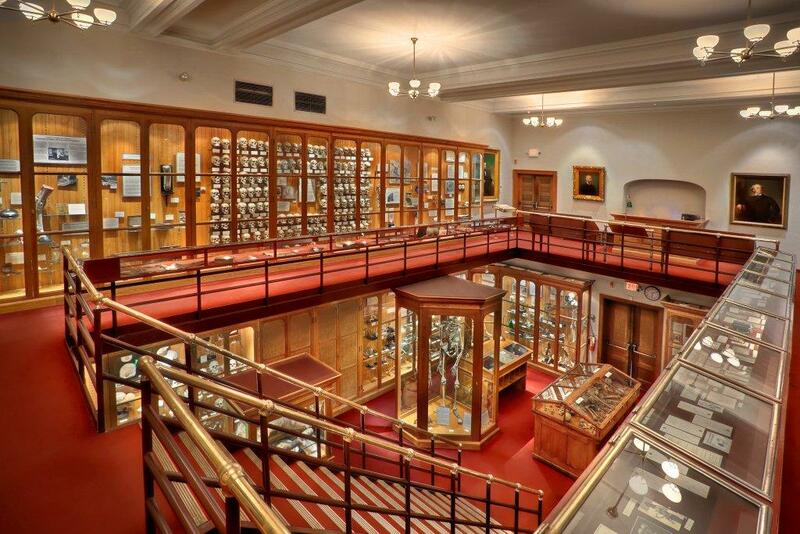 One fellow, Thomas Dent Mütter, MD, a popular lecturer and successful physician in private practice, donated a pathological anatomy collection that opened as the namesake museum in 1863. Although the museum’s collections have been used for teaching and research throughout the museum’s history, public visitors began arrive in ever-increasing numbers from the early 1980s and now over 130,000 come yearly. At the museum people see what they cannot see elsewhere: they can explore intimately and viscerally what it means to be human. Less conspicuous to casual visitors, the Historical Medical Library has been known internationally as one of the largest history-of-medicine collections in the United States with over 325,000 volumes including monographs, journals, manuscripts, archives, prints and photographs, pamphlets and incunabula (books printed before 1501). 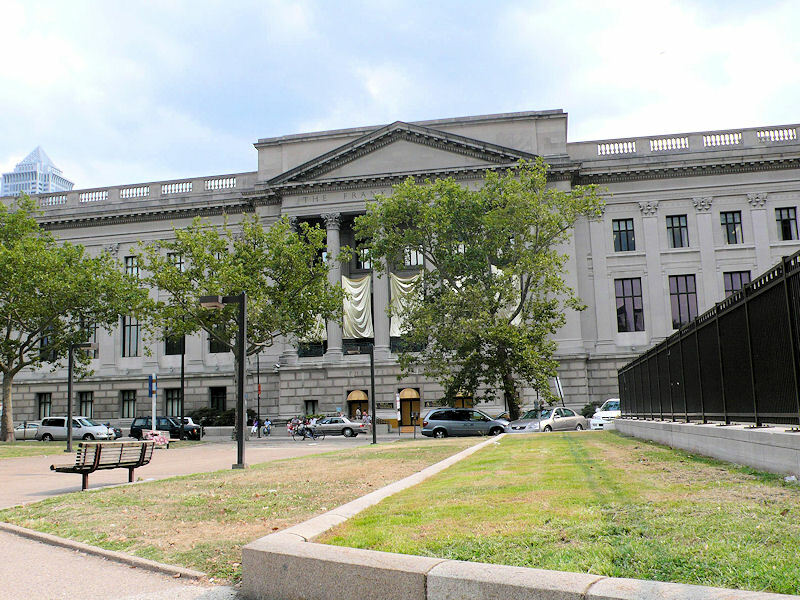 The library functioned as Philadelphia’s central medical library from the 1850s to the 1970s, serving its medical schools, hospitals, physicians, and other health professionals. Now, the library is conducting strategic planning to reinvent itself as a 21st-century special collections library. Administratively, the College is combining library and museum collections to elicit wider research interest and to use all collections for exhibits, web-based projects, and other initiatives. Most important, the library participates as an active member of the Medical Heritage Library, a digital consortium of east-coast libraries with substantial medical history collections (see: http://www.medicalheritage.org/). To reckon with the new reality of electronic access and research, the Historical Medical Library has embraced the “humanities” epithet to recognize its interest in courting new audiences and to situate itself within a broader intellectual territory. Even the “Historical Medical” moniker is a re-invention to reflect a changing status. Informally, we describe the library and museum collections jointly as the Center for Medical Humanities. 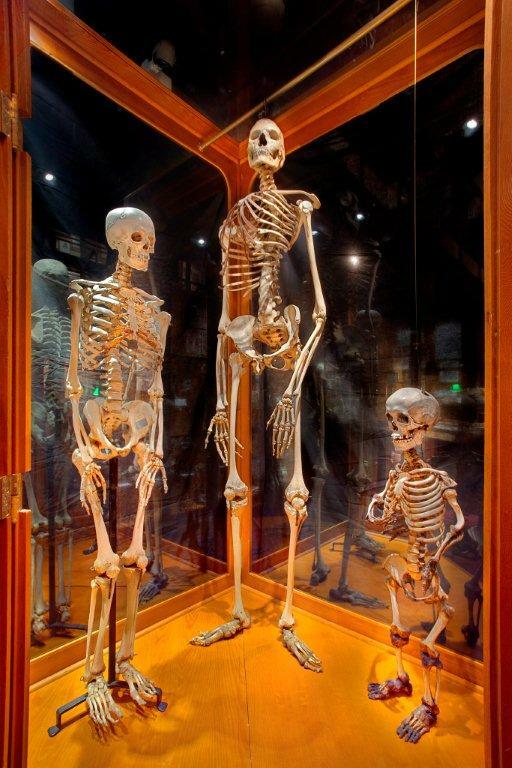 Our web-based outreach speaks to this humanities approach: the College collections inform our award-winning History of Vaccines website and our popular YouTube programs, What’s on the Curator’s Desk, the Mütter Minute, and No Bones about It (see: http://www.collphyphil.org/Site/mutter_museum.html). History of Vaccines speaks to the manner in which the College aims to use medical history to inform public health. In effect, the College has created its own television channel with social media and web-based programs. Additionally, happenings at the Mütter Museum and Historical Medical Library are followed through Twitter, Facebook, and Flickr. 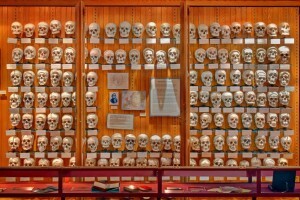 The Hyrtl Skull wall. Photograph credit: George Widman, 2009, for the Mütter Museum of The College of Physicians of Philadelphia. The museum, on the other hand, contains about 25,000 specimens and artifacts with well-defined collecting foci; approximately 12% of the collection is on display. An unusual institutional survivor, the museum features its displays in 19th century vitrines and cabinets, contributing to an ambiance that visitors find attractive. To some degree, then, the Mütter is a museum of itself although its collections remain vital for historic and scientific research. The permanent exhibit contains specimens that many people return to visit as old acquaintances. The tallest skeleton in North America (7’6″) stands alongside Mary Ashberry, an achondroplastic dwarf; the conjoined livers of the original Siamese twins, Chang and Eng Bunker, reside underneath a plaster cast of the twins, produced post-autopsy; and a display on the assassination of Abraham Lincoln includes tissue removed from assassin John Wilkes Booth. 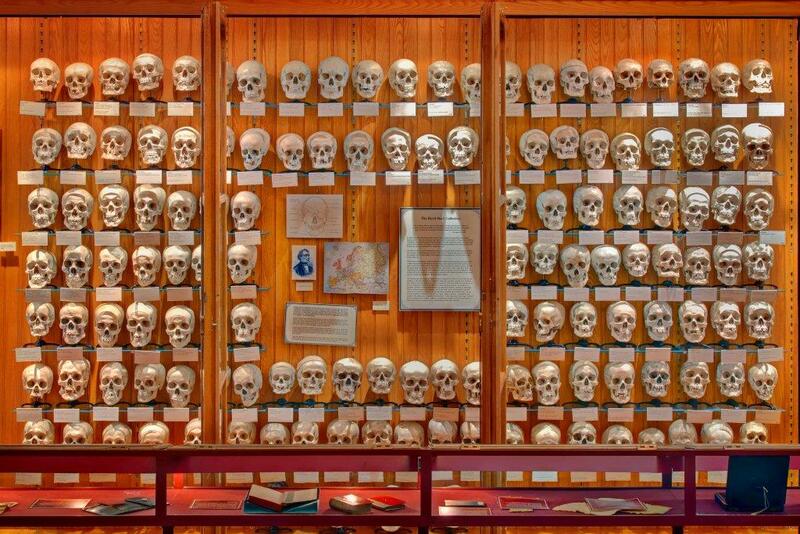 Over a hundred skulls of the Hyrtl Skull Collection face the viewer, and on each skull anatomist Josef Hyrtl, MD wrote the data of scientific interest in the 1850s: name, occupation, cause of death, age, birthplace, and religion, data constituting brief and poignant life histories. Facing a collection of teratology (“monstrous births”), the tools of pioneer bronchoesophagologist Chevalier Jackson surmount drawers and drawers of swallowed objects recovered without surgery, hundreds of specimens that enthrall many visitors as unusual medical curiosities. 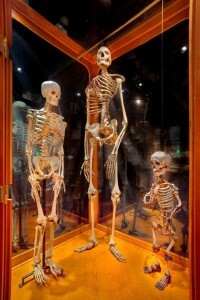 In a corner nearby stands the skeleton of Harry Eastlack, the only complete skeleton on display in North America that shows his disease, fibrodisplasia ossificans progressiva, a rare disease in which the connective tissue ossifies, eventually suffocating the victim. Although a rare phenomenon, the key to understanding this disease is the key to understanding bone growth. The Mütter American Giant. Photograph credit: George Widman, 2009, for the Mütter Museum of The College of Physicians of Philadelphia. Exhibits and collections as rich and varied as these specimens attract researchers. Recently, a Canadian team removed samples of 19th century cholera tissues in a search for viable cholera DNA. The research aims to map cholera epidemics world-wide over two centuries and to date no pickled 19th century specimen has yielded viable DNA—until now. One sample produced the sought result. The Hyrtl skulls have always attracted researchers: following the end of civil war in former Yugoslavia, war crimes investigators studied Croat skulls in the collection to help identify anonymous victims of mass murder. Some recent exhibits have highlighted public health challenges. In response to a (funded) request from the City of Philadelphia to complement its public health program to reduce lead poisoning, the museum created The Devouring Element: Lead’s Impact on Health which featured library and museum collections to explore our love-hate relationship with lead since antiquity. In 2013, the 150th anniversary both of the Battle of Gettysburg and the Mütter Museum, the College will open a permanent exhibit on the medical dimension of the war, Broken Bodies, Suffering Spirits: Injury, Death, and Healing in Civil War Philadelphia. The exhibit will focus on the body, affording an intimate look at a white soldier, black soldier, and white female nurse. It asks visitors to consider the health of the soldiers and nurse, expectations for health care and mortality, and their relationship to physicians. The exhibit argues that during the war, injury, recovery, and death were managed in new ways and the war changed soldiers’ relationships with their own minds and bodies. The College has developed a close relationship with the visual arts, most recently by commissioning internationally-renowned film artists, the Quay Brothers, whose meditation on the collections resulted in the film, Through the Weeping Glass: On the Consolations of Life Everlasting (Limbos and Afterbreezes from the Mütter Museum), funded by the Philadelphia Exhibits Initiative of the Pew Center for Arts and Heritage. More information can be found here: http://www.pcah.us/the-center/newsroom/center-spotlight-september-2011/. The Museum of Modern Art curated a small exhibit on the making of the film, now on view at the College, and the film is shown throughout the day. 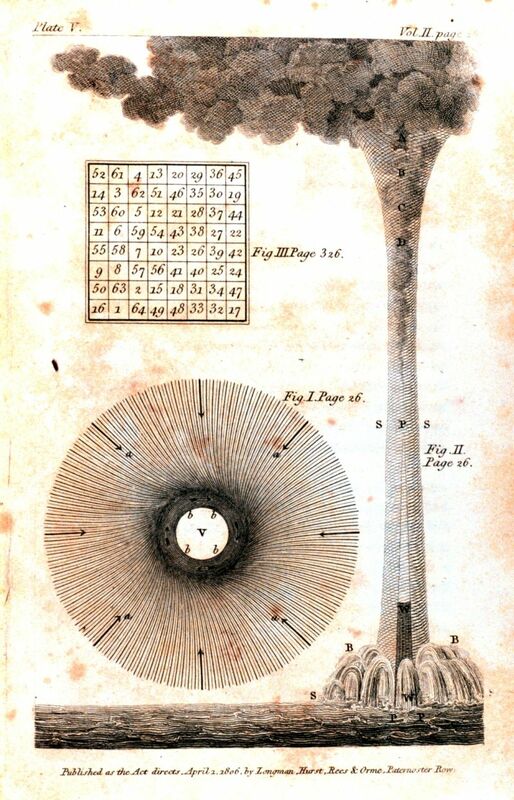 Our resources related to the history of science are abundant, even if a little disturbing. We invite visits or communications from historians of science. We also have a small travel grant program available to researchers: http://www.collphyphil.org/Site/travelgrants.html. Contact the Director, Dr Robert Hicks, at rhicks@collegeofphysicians.org. One of the great intellectual heroes of the 20th century was German-Jewish mathematician Emmy Noether. Born in 1882, she was remarkable in that her accomplishments in the field of abstract algebra emerged despite considerable prejudice against her, first because of being a woman, and second because of her ethnic background. She taught in the 1920s and early 1930s at the University of Goettingen. Then in 1933, with the rise of the Nazi regime, an act was passed “The Law of the Restoration of the Civil Service” forbidding those of Jewish background to teach in Germany, unless they had been World War I veterans (a concession made to placate Hindenburg). Noether fled Germany and obtained a position at Bryn Mawr College in the US. She died two years later. -Albert Einstein, New York Times, May 1, 1935. Emmy Noether’s grave is in a quiet, monastery-like part of Bryn Mawr campus, known as The Cloisters. The grave marker, with her initials and years of birth and death only, is very plain and right in the pavement. This article is adopted from a piece posted on the Philadelphia Area Center for the History of Science (PACHS) blog. Photos by Aden Halpern. 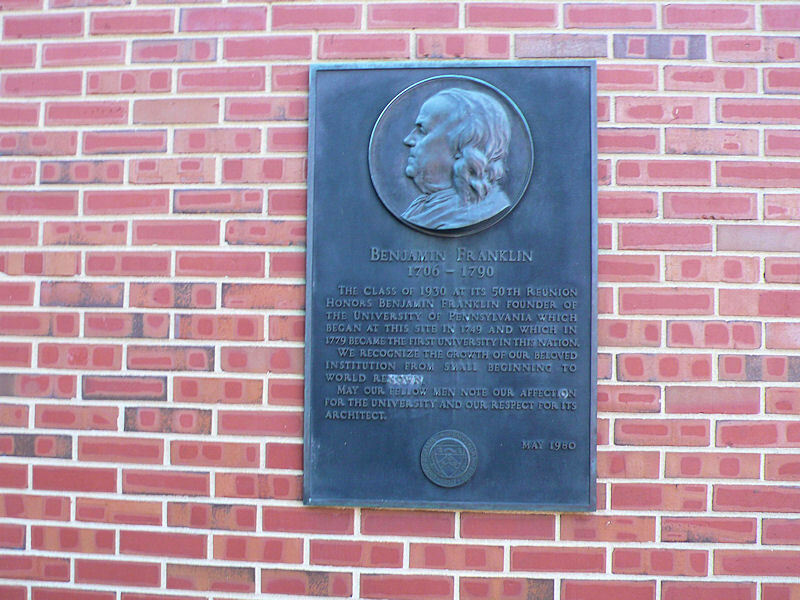 In honour of Benjamin Franklin’s 306th birthday (this article was published on 17 January 2012) and the upcoming 2012 Three Societies’ Meeting in Philadelphia, we have a special BSHS Travel Guide entry on sites relating to Benjamin Franklin in Philadelphia written by Paul Halpern, Professor of Physics at the University of the Sciences in Philadelphia. Benjamin Franklin, inventor, scientist, and statesman, lived in Philadelphia from 1723 until his death in 1790 (aside from multiyear stays in London and Paris). His contributions to the study of electricity capped an impressive career dedicated to public service. In Philadelphia numerous places and institutions carry his name. 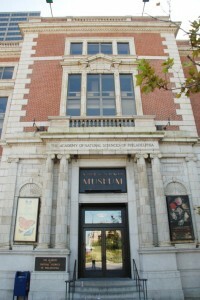 The Franklin Institute, funded in part through funds set aside from Franklin’s will, is one of many sites honouring Franklin in the city. Located on Logan Square, at 20th Street and the Benjamin Franklin Parkway, in the heart of Philadelphia’s museum district, the Franklin Institute is a large, classically-styled building with a columned façade. It houses one of the leading hands-on science museums in the United States, a collection of Franklin artifacts, and the Benjamin Franklin National Memorial. With a spacious rotunda designed by noted architect John Torrey Windrim and modelled after the Pantheon in Rome, the Memorial serves as the Institute’s main entrance. 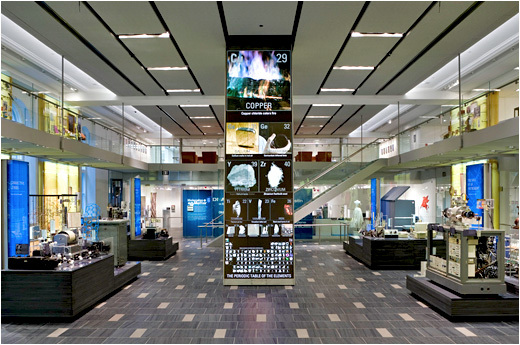 It is the only section of the Institute building that is free to the public; the science museum has an entrance fee. 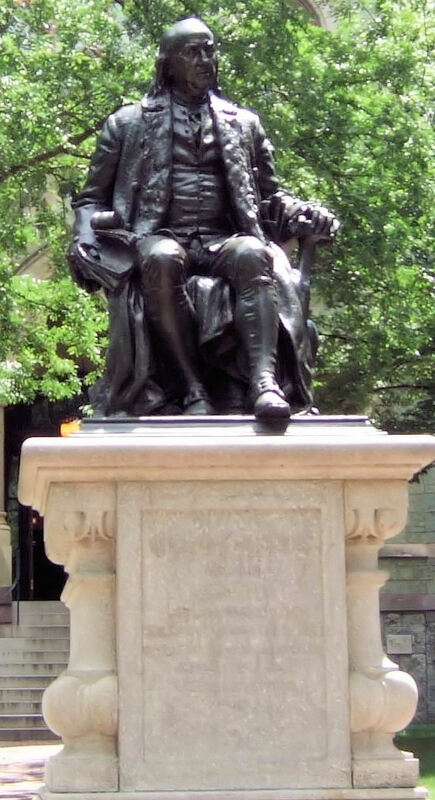 In the center of the Memorial is a six-metre high statue of Franklin, sculpted by James Earle Fraser. Beyond the Memorial is the science museum, which features numerous exhibits including a 26-metre Foucault pendulum, and a large steam train built in 1926. Outside the museum building is a Grumman Lunar Module, built for the Apollo program. 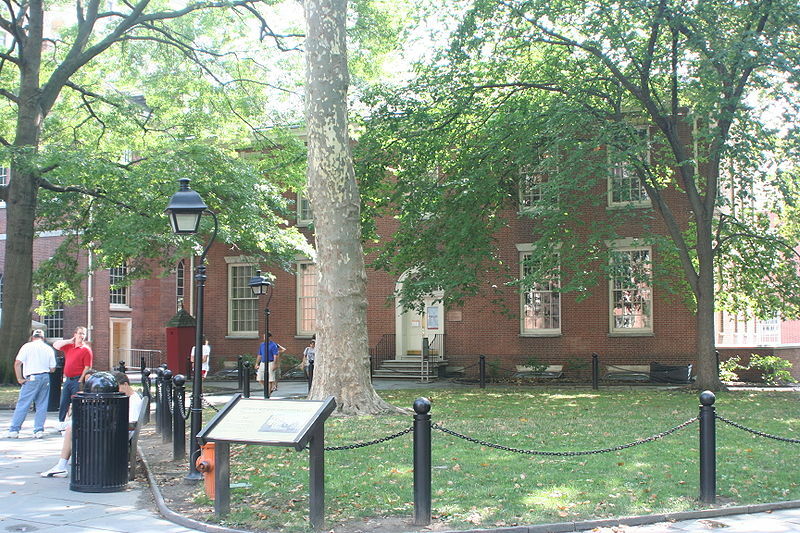 Another Philadelphia museum dedicated to Franklin is Franklin Court, the site of his former home and print shop, located near the corner of Market Street (Philadelphia’s high street) and Third Street. 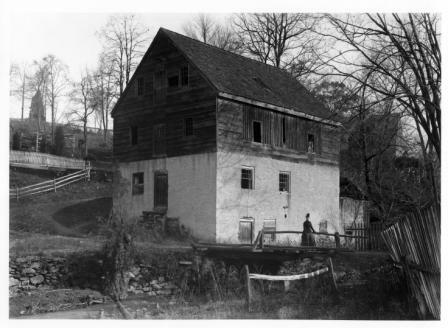 Although the original building had been demolished, in 1976, during the bicentennial of American independence, the ruins of the house’s cellar and foundations were excavated, and new structures were built to offer a sense of how it looked. An underground museum, free to the public, showcases Franklin’s achievements. Several streets away from Franklin Court are other notable sites related to Franklin. 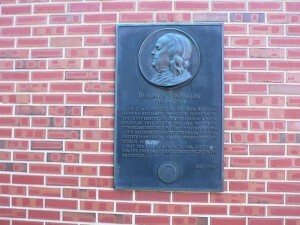 Franklin’s grave is located in Christ Church cemetery near the corner of Fifth Street and Arch Street. It is a tradition to toss pennies on his grave marker for good luck. At Fifth and Vine Street is the entrance to the Benjamin Franklin Bridge. 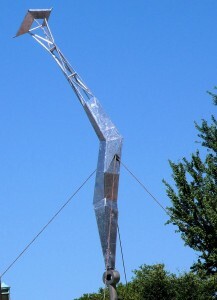 Within its entrance plaza stands a metal sculpture commemorating Franklin’s reported ‘kite and key’ electrical experiment. Designed by Japanese-American artist Isamu Noguchi to depict a kite and a lightning bolt, it is called Bolt of Lightning and was erected in 1984. Franklin was the founder of many organisations and scholarly institutions, including the American Philosophical Society and the University of Pennsylvania. The original site of the latter, the corner of Fourth and Arch Streets, is commemorated by a wall plaque. The current site of the University of Pennsylvania is in the western part of Philadelphia. There stands yet another Franklin memorial, a bronze statue of a seated Franklin created by John J. Boyle in 1899. Bronze statue of a seated Franklin created by John J. Boyle in 1899.